Elegant Printed Saree made from Georgette fabric. The sai is Hemmed and fall is already done. it comes with un stitched blouse piece. Hand was separately in cold water. Dry in shade, Made from Polyester Yarn. This item in Indian Sarees category was first added to our catalog on 11-08-2015. Buy Georgette Cocktail Printed Party Wear Saree , sold & shipped by Shieno Boutique where you can shop online for Latest Sarees, Salwar Kameez, Shawls, Jewelry & Clutches. 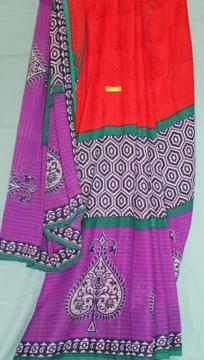 This Sarees collection has been tagged as Cheap Saree, Women Clothing, Sari On Sale In Usa.